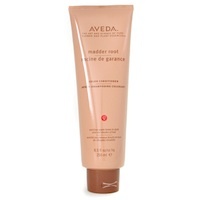 I have medium to dark brown hair, and I love the red undertones this conditioner leaves. People complain about the staining on your hands and the shower, but I always wash my hands and do a quick rinse of the shower as part of my routine while waiting for the conditioner to work. My problem lies in the fact that it doesn't make my hair feel soft like my regular conditioner does. To remedy that, I just mix it with my regular conditioner to get the best of both worlds. I would give it 5 stars if it did what a conditioner is supposed to do.